Despite ripples of violence in pretty much every major professional sports league and many college programs, change has been slow. Beloved former Braves manager Bobby Cox was arrested in 1995 for allegedly punching his wife. When police arrived, Cox’s wife said, according to the police report, that “this has occurred many times before, but (she) never called the police because of possible media attention.” Seventeen hours later, Cox and his wife gave a press conference together claiming the police overreacted. That was enough for the press, the Braves and their fans. Five months later, Cox and the Braves won the World Series; 19 years later, Cox was in the Hall of Fame; 22 years later, he received his own statue outside SunTrust Park in Atlanta. It still stands there to this day, an inadvertent testament to the fact that Cox was too powerful to be touched. It is sometimes difficult to find social progress in the world of sports, but it does happen, incrementally, if still inadequately. And you can see it in the case of Ohio State coach Urban Meyer, who was put on paid administrative leave by the university on Wednesday after reports that Meyer had known one of his coaches had abused his wife and that Meyer didn’t do enough to stop it. The ex-wife of one of his top assistant coaches (who Meyer fired earlier this year) said that she had told Meyer’s wife (who also works for the university) about the abuse while it was happening, contradicting Meyer’s earlier denials. Meyer, one of the most powerful men in college football if not collegiate athletics, has not simply broken a bylaw. In a previous era, his power might insulate him. But in this era, he is complicit. Not reporting domestic abuse is a Title IX offense at public universities. But Meyer, one of the most powerful men in college football if not collegiate athletics, has not simply broken a bylaw. In a previous era, his power might insulate him. But in this era, following the scandals at schools like Penn State and Michigan State (not to mention the wrestling controversy already roiling Ohio State), he is complicit. In this era, he must pay. Good. 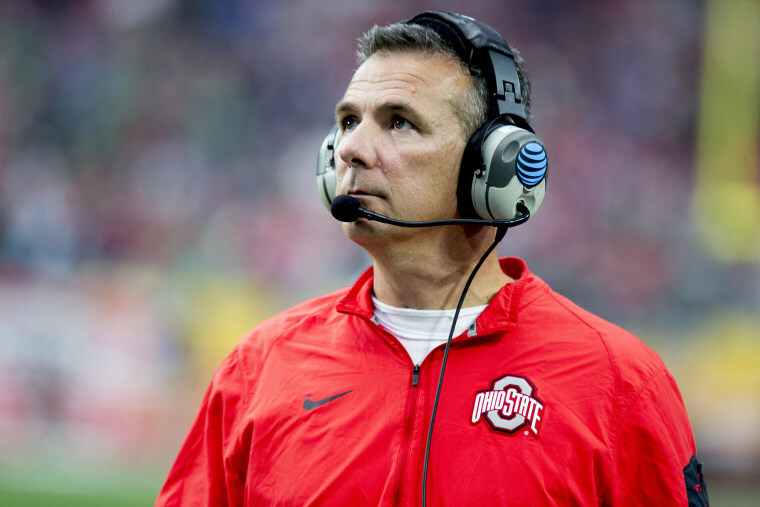 If the allegations against Meyer are true, they should haunt his career forever. Because in 2018, 177 total wins and an 11-3 Bowl Game record should not shield someone who has in any way enabled or covered up domestic violence. Elite athletics remains something of a boys’ club, and change has been slow. Despite ripples of violence in pretty much every professional sports league, there has not yet been a definitive #MeToo moment. As just one example, Aroldis Chapman — who served a 30-game suspension for an incident with his wife back in March 2016 — is once again closing games for the Yankees. (There are 162 games in the regular season.) Obviously, there is still a long way to go. But we are seeing signs of shifting attitudes. When the Cubs traded for Chapman in July 2016, the backlash was relatively muted. Just two years later, the Astros' acquisition of Roberto Osuna has landed Astros general manager Jeff Luhnow in much more hot water. (Osuna was charged with domestic violence earlier this year and is currently suspended by MLB; his trial is ongoing.) Some Houston fans have gone so far to say they will no longer cheer for the team. The Astros were hammered in particular for claiming to have a “zero tolerance” policy on domestic violence when they obviously do not have such a policy. It has been a disaster and Osuna’s suspension isn’t even over yet. The broader #MeToo movement and social media generally has changed the way the sports world discuss these issues. But what is perhaps more telling is how institutions and leagues have recently attempted to adjust their policies. Had the Braves tried to fire Bobby Cox two decades ago, they would likely have been severely criticized. But today, Meyer went from one of the most powerful figures in collegiate athletics to a toxic figure in the span of an afternoon. His life’s work, his status as one of the most revered, celebrated figures in college athletics is in jeopardy. If Ohio State eventually fires him — and it is beginning to feel a bit more like when than if — he may never get a high-profile job in the sport again. (Alternatively, he could rehabilitate his career and stage a comeback, as we have seen with coaches like current Penn State coach James Franklin.) Whatever happens, however, Meyer’s punishment does not erase the many men who went unpunished before him. We are talking about it now, although assuredly not enough. This is small progress. It is insufficient progress. But it is still progress. Atlanta built Bobby Cox a statue. Will there be statues built for Urban Meyer?